The New England Patriots entered their week four match up with the division rival Miami Dolphins seeking to rebound from two-straight losses and avoid their first 1-3 start since 2001. Per @EliasSports the last time the #Patriots played a division game against a team two games in front of them in the standings: Tom Brady's first career start exactly 17 year ago today. Devin McCourty on brother Jason, via CBS pregame: "What annoys me most about this guy, um, is just his face. He kinda looks like me, but he doesn't. So, to look at it is kinda weird." Early on in the first quarter, newly signed wide receiver Josh Gordon tallied his first reception as a Patriot which helped setup the first points of the game. A Stephen Gostkowski 20-yard field goal put the home team ahead 3-0. In the second quarter, with the score still low, Cordarrelle Patterson found a hole in the Dolphins secondary for his first touchdown reception as a Patriot. 10-0 New England. 3rd longest reception of @ceeflashpee84's career. In what became a recurring theme throughout the game, the Patriots defense turned in its best showing of 2018. Shutting down the Dolphins offense, especially on third down. Pats D doing a good job of keeping them in long-yardage situations so far. Despite the great start, Patriots head coach Bill Belichick wasn’t going to be pleased with his offense committing three penalties on play. Three separate penalties by the Patriots' offense on one play. I'm sure Bill Belichick will be pleased about that one. These are the Dolphins I'm used to seeing in Foxboro. Still leading 10-0 with seven minutes to go in the half, linebacker Kyle Van Noy forced a fumble that setup a James White 22 yard touchdown run on the very next play. 17-0 in favor of the Patriots. As the defense continued to do its job keeping the Dolphins offense off the field, the Patriots offense was clicking as Phillip Dorsett hauled in this acrobatic catch just before halftime. Patriots 16 first downs, Dolphins 4. Patriots 272 yards, Dolphins 75. 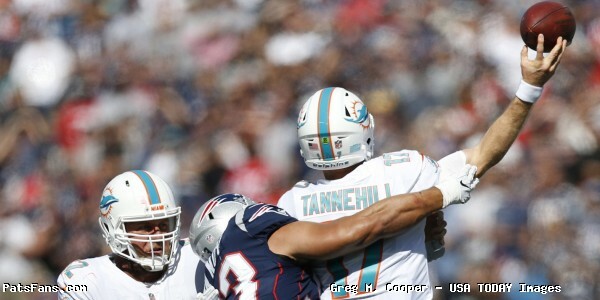 Patriots 6-9 on third-down conversions, Dolphins 0-6. Patriots 42 plays, Dolphins 22. Patriots 24 points, Dolphins 0. 24-0 Patriots at the Half. During the halftime break, the New England Patriots honored newly enshrined team Hall of Famer Matt Light, who provided a very “colorful” speech to the fans. "This organization is the greatest organization in all of sports." In the third quarter, the Brady/White combination struck again with another touchdown, and all but putting the game away. 31-0 Patriots. With the Patriots up 31-0 and the defense continuing to shut out the Dolphins, rookie Sony Michel capped off his career day with his first career touchdown run. Michel ran for 112 yards on 25 carries with the touchdown, his first career 100 yard rushing game. 38-0 Patriots. The #Patriots have scored 38 points today. Combined, the #Dolphins/#Bills/#Jets have scored 3 points. With a 38-0 lead, the Dolphins managed a garbage time touchdown with 2:42 remaining in the game when Frank Gore caught a six-yard pass from backup quarterback Brock Osweiler. The Patriots would go on to win by a final score of 38-7. @ceeflashpee has a message for Patriots Nation after that home W.
Find someone you look at like Brady looks at Amendola. Patriots survive Sept. 2-2. Backfield combo established. Solid defensive performance. Gordon feet wet. Get Gronk healthy. Edelman is in the parking lot. This entry was posted in Patriots Photos, Patriots Twitter, Patriots Video and tagged Chris Hogan, Cordarrelle Patterson, Dan Koppen, Danny Amendola, Danny Shelton, Deatrich Wise, Elandon Roberts, josh gordon, Julian Edelman, Kyle Van Noy, Phillip Dorsett, Raymond Clayborn, Sony Michel, Tedy Bruschi, Tom Brady on October 2, 2018 by Robert Alvarez. Tom Brady was back on the football field Friday night. Brady and a few current and former Patriots teammates took to the field at Harvard Stadium for Brady’s 19th annual Best Buddies Tom Brady Football Challenge fundraising event. 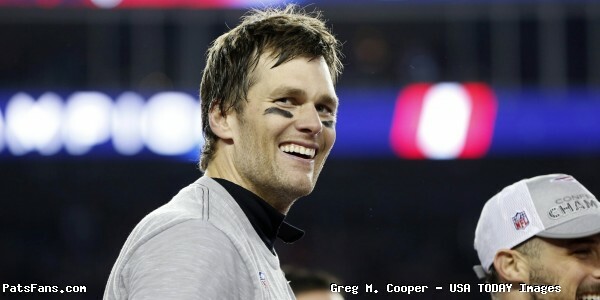 Over the course of the evening, Brady was scrambling out of the pocket away from a defensive line filled of kids while throwing touchdown passes koppto Julian Edelman, Troy Brown, and even ESPN NFL Analyst Adam Schefter. Other notable Patriots in attendance were Tedy Bruschi, James White, Chris Hogan, Christian Fauria, Dan Koppen, Jason McCourty, Devin McCourty, Ted Karras and Scott Zolak. The game ended in a highly competitive 112-112 tie. Check out some of the best sights and sounds below. That’s Tom Brady’s 5 y.o. running the field @Harvard for the @bestbuddies Football Challenge. Had a great time playing flag football with old friends at the Best Buddies Challenge today! Always good seeing old friends and making new friends with @bestbuddies ! This entry was posted in 2018 Patriots Offseason, Patriots News, Patriots Photos, Patriots Twitter, Patriots Video and tagged Christian Fauria, Dan Koppen, Devin McCourty, James White, Jason McCourty, Julian Edelman, Scott Zolak, Ted Karras, Tedy Bruschi, Tom Brady, Troy Brown on June 4, 2018 by Robert Alvarez. In one of the most anticipated games of the 2017 season, the New England Patriots prepared to welcome in the Atlanta Falcons for a Super Bowl rematch, and while Bill Belichicks team wasn’t taking the time to think about the past, it was hard to ignore the Gillette Stadium fans reminding both teams of the epic comeback during pregame. As shared by NESN’s Zack Cox in the tweet below, Patriots long snapper and Naval officer Joe Cardona played a role in providing 200 tickets to men and women serving in the US Armed Services so they would be able to attend the evenings game. Two Boston College legends met on the field before the game. Just before kickoff, the Patriots held a special on field tribute to cancer survivors as part of the NFL’s “Crucial Catch campaign that featured Tom Brady’s mother Galynn making her return to Foxboro. Celebrating bravery, strength & hope. Quite a moment at @GilletteStadium. As for the game itself, the Patriots offense struggled early on to find a rhythm, but the defense stepped up, as Cassius Marsh swatted away three points from the Falcons and fired up the normally “all business” Bill Belichick. The Patriots would strike first in the second quarter, with Brandon Cooks following the blocking of Rob Gronkowski for a 7-0 lead. Midway through the second, an errie fog settled in over the Gillette Stadoum field that would provide an interesting backdrop (and internet memes) for the remainder of the game. After a Stephen Gostkowski field goal, the Patriots were on the move again, as James White provided even more Super Bowl flashbacks with a touchdown of his own just before halftime. 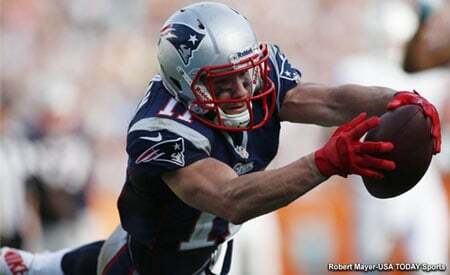 17-0 Patriots going into the half. At halftime, the Patriots honored their three Pro Football Hall of Famers with a special ceremony awarding them ”rings of excellence”. In the second half, the Patriots defense continued to stymie Matt Ryan’s offense as two more field goals put the Super Bowl champs ahead 23-0 midway through the fourth. Are we sure this is the same #pats D we saw in the first 6 games??? Balling tonight! Almost 76 minutes & counting #Falcons haven't scored 1 point! Patriots unanswered points against the Falcons tracker: 54. Falcons kicker Matt Bryant also did his best Nick Folk impression. Kyle Van Noy provided a huge tackle on fourth down to again keep the Falcons off the scoreboard. 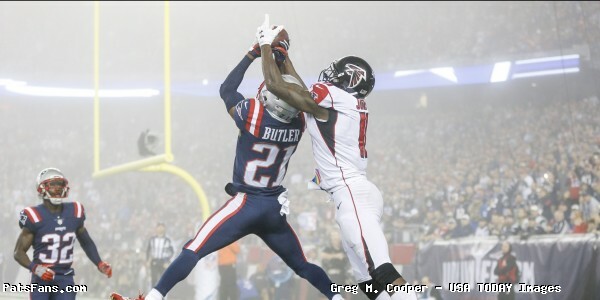 With four minutes to go in the game, the Falcons at last broke through on the scoreboard after an incredible touchdown reception by Julio Jones after he jumped above Malcolm Butler. If my calculations are accurate, Patriots held the Falcons scoreless in 83:10 of gametime dating back to Super Bowl LI. That would be all the Falcons could muster as the Patriots improved to 5-2 in 2017 following an impressive complete performance on both sides of the ball. A 23-7 victory heading into a home matchup with the San Diego Chargers next week. Don't look now, but the Patriots' defense ranks fourth in the NFL in points allowed/game over their last three games with 12.7. Great team win! Still hungry for more. This entry was posted in Patriots Photos, Patriots Video and tagged Andre Tippett, Brandon Bolden, Cassius Marsh, Chris Hogan, Dan Koppen, Dion Lewis, James White, Malcolm Butler, Raymond Clayborn, Tom Brady on October 25, 2017 by Robert Alvarez.